European Elder plants are also known as the Black Lace Sambucus or Black Elder. that will grow 8-20 feet tall with a spread of up to 8 feet. Elders have deeply veined, serrated foliage and produce large flat clusters of flowers in late spring to early summer, followed by small black berries which provide food for many species of birds. The berries can be harvested and used for making elderberry wine or jam. Native Americans used the berries to make a lotion for treating skin infections. 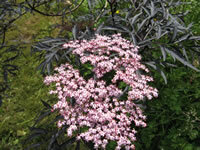 but the Black Lace Elder is well worth growing in your landscape. Sambucus leaves, bark, roots, and buds can be toxic to pets. 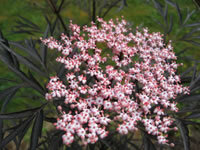 Black Lace Sambucus plants are hardy in USDA zones 4-10 but they grow best in cooler climates. Elders grow best in full sun. They tolerate light shade, but their coloring will not be as deep. They should be planted in reasonably fertile, water retentive, well drained soil. Once established they are fairly drought tolerant plants. shrub type fertilizer according to label directions. Elder plants tend to get a bit scraggly with age so they can be pruned immediately after blooming. Remove older branches and cut back young shoots by a half. Make all cuts just above healthy bud growth. Young plants can be pinched back to induce bushiness. 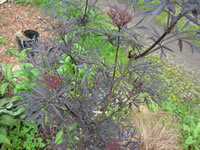 Sambucus plants can be grown from seed sown directly in the garden in the fall. Propagate with stem cuttings taken in the summer or winter. Sucker growth can be dug and divided in the spring, summer or fall.